Chronic Wasting Disease was confirmed by the Virginia Department of Game and Inland Fisheries in 14 deer in Frederick County and two deer in Shenandoah County during the 2017 deer hunting season. Fifteen of the deer were harvested by hunters and one deer was killed by a vehicle. Approximately 1,500 deer from Frederick, Clarke, Warren, and Shenandoah counties were tested for CWD during the 2017 hunting season. Since 2009, 38 CWD-positive deer have been confirmed in Frederick (35) and Shenandoah (3) Counties. The Virginia CWD Containment Area borders are expected to remain the same – the four counties named above – for the fall 2018 hunting season. DGIF plans to collect CWD samples from the Containment Area on the first two Saturdays of the 2018 firearms deer season. All hunters who harvest deer within the CWD Containment Area (CA) on the first two Saturdays of the general firearms season must bring their deer to a CWD check station for testing. Continuing into 2017, the CWD Containment Area includes all of Frederick, Clarke, Warren, and Shenandoah counties. On non-mandatory sampling days hunters can bring the heads of deer that they wish to have sampled to any of the five refrigerator drop points (see list further down the page). 2016 sampling efforts identified 9 new CWD-positive deer in Frederick County. As of August 2017, Virginia has diagnosed 22 CWD-positive white-tailed deer. 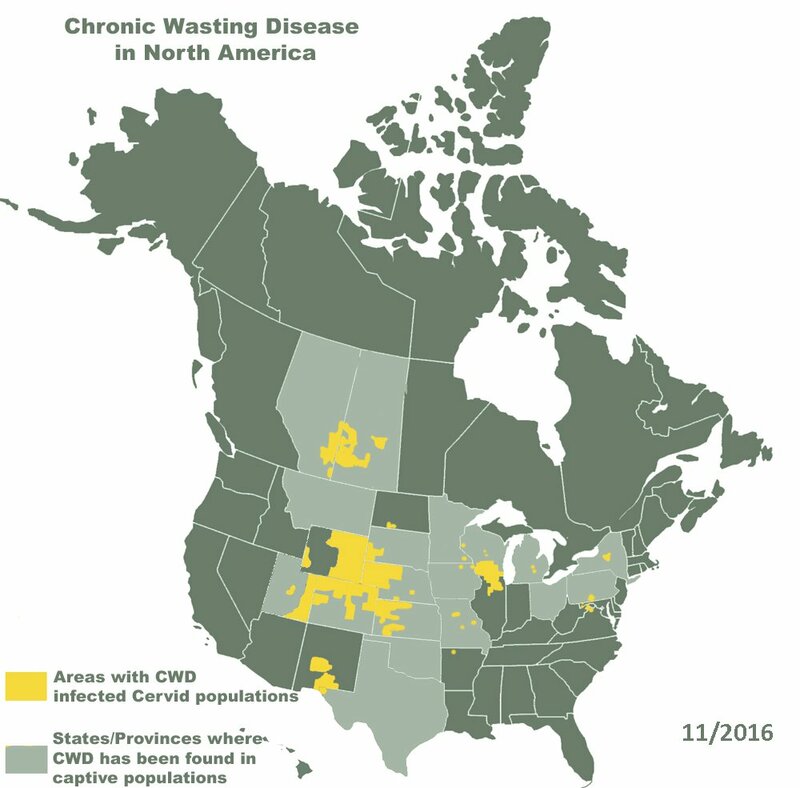 CWD has been found in 24 states and 2 Canadian provinces. For more information about this disease please see our links further down this webpage.